Oceanco’s 110m Jubilee won two top design awards at the 29th International Superyacht Society (ISS) Gala during the Fort Lauderdale International Boat Show — the yacht featuring exterior styling by Igor Lobanov and interior design by Sorgiovanni Designs, was presented with the award for Best Power Yacht 65m + as well as Best PYC yacht of 2018. 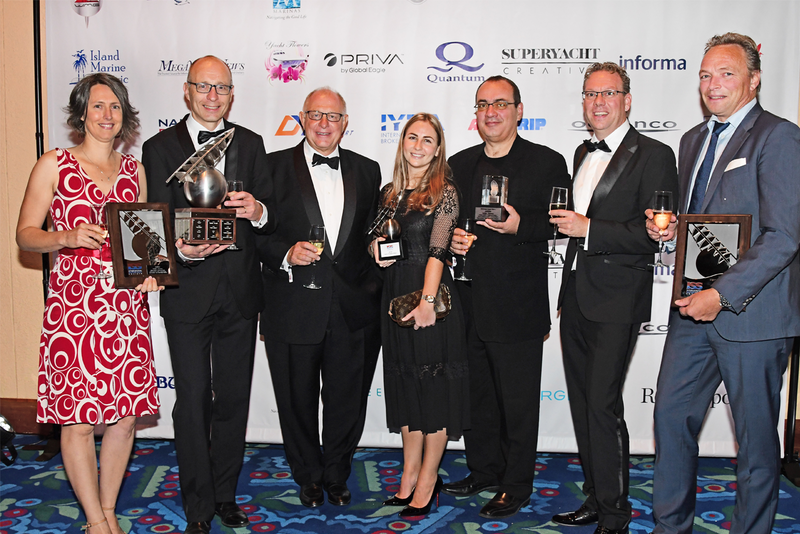 Oceanco is proud to participate annually in the festive ISS Awards Gala held at the Broward Center for the Performing Arts as sponsors of the ISS Fabien Cousteau Blue Award. This year, Iris Bosschaart, Oceanco’s Brand and Communication Coordinator, was on stage to welcome Fabien Cousteau, grandson of the famed Jacques Cousteau. Fabien Cousteau, in turn, presented his namesake Blue Award to the REV OCEAN Project. The REV (Research Explorer Vessel), scheduled to launch in 2020, was created to house scientists to map and survey the ocean’s marine life and to create solutions and act as a centre of gravity for change. “The REV will be a platform for gathering knowledge,” adds spokesperson, Kjell Inge Røkke.